You can edit any Lesson Plan item, or any group of selected Lesson Plan items. Editing a Lesson Plan item has no effect on Assignments created from that item. Likewise, editing an Assignment does not have any effect on the Lesson Plan item that it originated from. Add multiple items to a Lesson Plan with repeating or incremented PLC text. Copy a Lesson Pan item to create more Lesson Plan items with repeating or incremented PLC text. Use this feature to change any one or more fields for a single Lesson Plan item at a time. You can use the Previous/Next icons to move between items on the list. 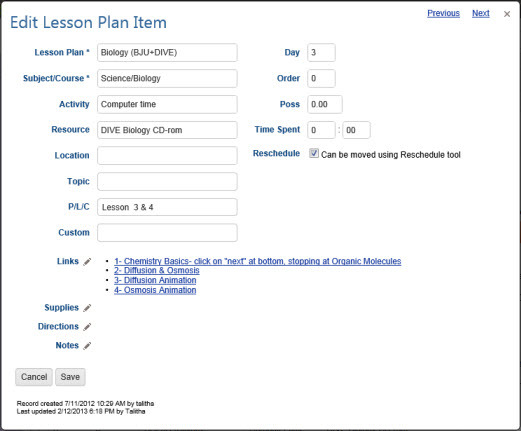 On the Lesson Plan page, use the Lesson Plan Selector to choose an existing Lesson Plan Name. Double-click on the Lesson Plan Item you want to change to open the Edit Lesson Plan Item window. Alternatively, you can click once on the item you want to change and then click the Action button and choose Edit to open the Edit Lesson Plan Item window. On a touch device, touch the item you wish to edit and then touch the Action button and touch Edit to open the Edit Lesson Plan Item window. The Subject or Subject/Course, Activity, Resource, and Location fields are all Smart-Entry Fields. Smart-Entry fields allow you to create new entries for each of these fields 'on-the-fly'. Simply type in the new entry you need and HSTOnline will automatically add it to the appropriate list. If you change the Lesson Plan Name while in the Edit view, the item will no longer belong to the original Lesson Plan, but to the new plan selected. If you want to give the same item to another plan while keeping the original, use the Copy to Another Lesson Plan feature. Save to keep your changes and update the Lesson Plan. The Previous or Next hyperlink in the top right corner to save your changes to this item and move to the previous or next item in the list. You can click or touch Previous or Next until you have made all the changes you want and then click the Save button to end the Edit process. If you reach the beginning or end of the list when clicking or touching Previous or Next, the Edit window will close and you will be returned to the list view. If you have entered a new Subject or Course in the Subject or Subject/Course field, HSTOnline will ask for clarification when you click or touch the Save button or the 'Previous' or 'Next' link. Cancel to be returned to the Add Lesson Plan window to make a new selection in the Subject/Course field. Save to keep the new Subject or Course and add the item to your Lesson Plan. Use this feature to make the same change to any two or more Lesson Plan items at the same time. Choose the Lesson Plan items you want to multi-edit. You can use your mouse to click and drag over contiguous items in the list to select those items. On a touch device, you can touch and drag your finger over contiguous items in the list to select those items. 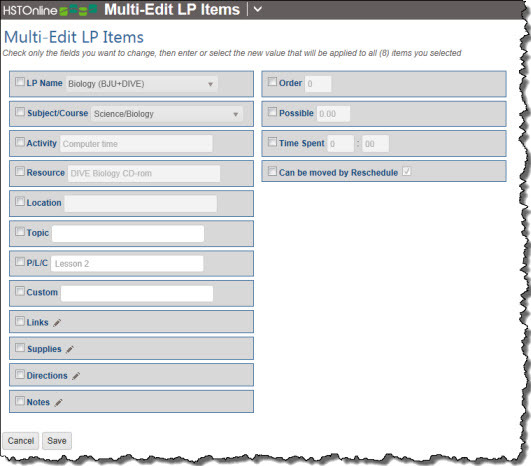 Click or touch the Action button and click or touch Multi-Edit to open the Multi-Edit LP Items window. The fields in the Multi-Edit window will show the settings for the first Lesson Plan item in your selection. To enable the form, click or touch the box to the left of each field you want to change for all selected Lesson Plan items. Make your selection for each of those fields.